Juana Melara is a housekeeper at the Westin Hotel in Long Beach. She is part of the mostly invisible workforce that is mainly comprised of immigrant Latina women seeking a better life for their families. 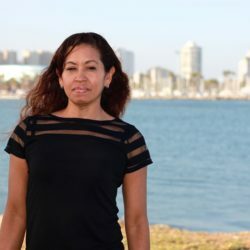 Although the work that she does is very important and helps to strengthen the local economy, she often feel that most people including hotel patrons rarely understand how hard housekeepers work. On any given day, Juana must clean between sixteen and twenty rooms in an eight hour shift. She is expected to finish cleaning each room in 30 minutes and often works through her mandatory ten minute break and has very little time to go to the bathroom. Although Juana works in a billion dollar industry, she often has to purchase her own cleaning supplies because she is not provided with enough supplies to complete her work. These types of things should not be happening in a world class city like Long Beach, but unfortunately they are a common occurrence and that needs to change. That is why Juana came together with her coworkers to demand better working conditions for her and thousands of other hotel workers in Long Beach. Both Juana and her husband of thirty years work in the hotel industry, and they feel great pride that through their hard work, they have provided an honest living for their children. We know that we provide a great service and that, without our work, the hotel industry would not be as prosperous as it is.